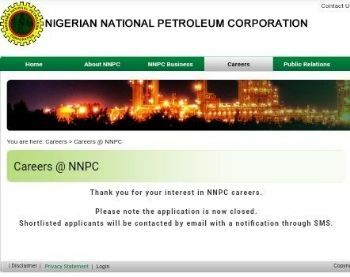 The 2019 NNPC Recruitment Application Portal has closed and the next stage of the recruitment exercise is the Second Phase. According to the Group General Manager Group Public Affairs Division, the Phase One of the ongoing recruitment exercise by the Nigerian National Petroleum Corporation (NNPC) which kicked off via nationwide advertisements in the national dailies and online media on Wednesday, 13 March, 2019 ended midnight yesterday with the closure of the corporation's application portal. A release today in Abuja by the corporation's Group General Manager, Group Public Affairs Division, Mr. Ndu Ughamadu, said the Second Phase of the exercise involving shortlisting of qualified candidates had started, explaining that the qualified ones among them would be invited to participate in a computer based aptitude tests. Mr. Ughamadu said in the release that tests would be administered in about 50 centres across the country, saying those who emerge successful in the tests would subsequently be invited for oral interviews for final selection. NNPC, an equal opportunity employers in the Oil and Gas Industry value chain, including exploration, refining, transportation and marketing of petroleum products, recently placed advertisements to recruit some categories of new hands to buoy its operations nationwide. These are: Graduate Trainee; Senior officer and Supervisory Cadre; and Managerial Cadre.